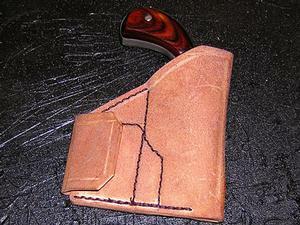 Rob started making these for his gunstore customers in the early 1990s. Many of the customers worked at the local university and had to carry concealed, because carrying a personal protection weapon was a career ending thing, if caught. He was surprised at how many of these educators chose to carry in spite of their job being on the line. They all related the same thing: they knew just how violent their campus was, and held their own life, and their students life more precious than a job or career. 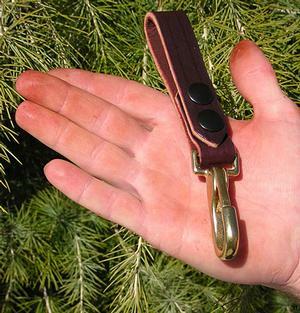 Rob carried one of these of his own making, for years before that. 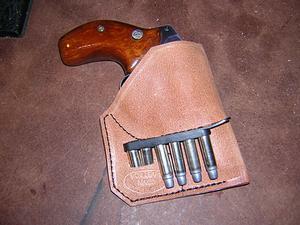 We make this for just about every gun model you can fit into a pocket or briefcase. 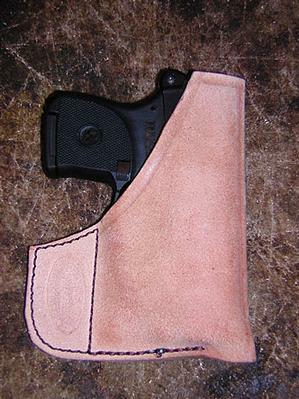 This works best with small pocket autos like the 3AT or LCP and small 5 shot 38's.To view guns we can make this holster for click here to view gun chart. 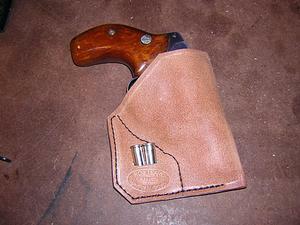 This allows for the safe carry of your small pistol in your pants pocket, the trigger guard is covered. This preventing keys, pocket knives or spare ammo from getting caught up in the trigger. 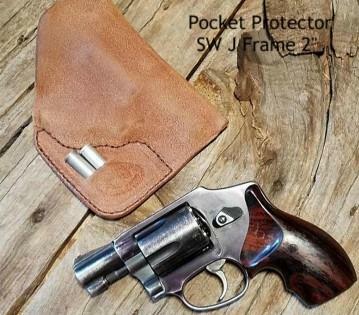 Many women carry Pocket Protectors in their purse pockets to stabilize their gun and prevent things from getting inside the trigger guard.